10 seconds to 20 minutes ‘ON TIME’. 1 minute to 12 hours ‘OFF TIME’. Controls timed equipment during daytime only, nighttime only or both. Use to time fans, pumps or CO2. Plastic enclosure protects internal components from dust and moisture. 15 Amps/120 Volts/60 Hz./1/3 HP. Do you have a timer like this that will work on a 12V system? 12 V AC or DC? Is it the source power or the switched power or both that has to be 12V? 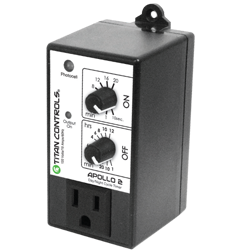 I ask because there is the Bigelow Brook Farms controller that is more flexible as to the power and might be able to do what you want. Let me know the details and I can check for you.